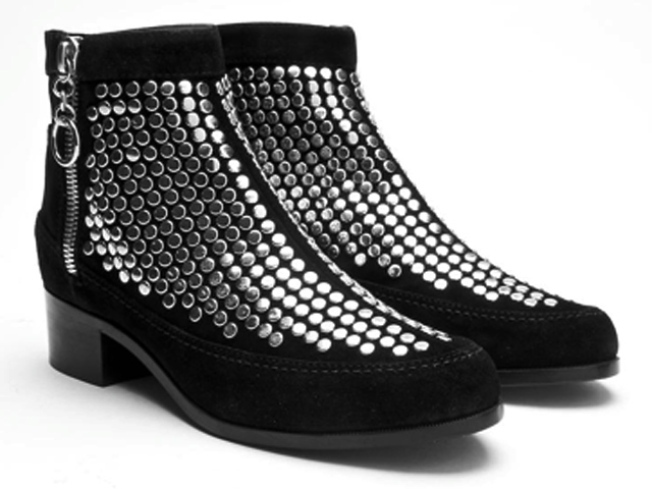 The Proenza Schouler studded mini-boot we covet so. FIT FOR A KING: Is it just us, or do these wicked awesome (yes, every so often, something deserves that descrip) low stack-heeled ankle boots peppered with silver studs make you want to wear a single – preferably matching – glove? The decidedly MJ-esque boots from Proenza Schouler are $1055 at Kirna Zabete, 96 Greene Street; 212-941-9656. PETAL PUSHER: You know who was so decidedly un-fashion week? Laura Ashley. And that’s precisely what made the First Lady of Floral so badass. From her humble beginnings making scarves at her Pimlico kitchen table to the prim (but veddy see-through) skirt the then Lady Di wore in that infamous photograph – an Ashley print, natch – the designer’s life and influence is chronicled in photos and drawings, many from the estate’s archivein the new coffee-table tome “Laura Ashley” by Martin Wood (Frances Lincoln); $36 at Strand Bookstore, 828 Broadway at 12th Street; 212-473-1452. SUI GENERIS: You, New Yorkers, are special – this is why you get first crack at the Gossip Girl-inspired Anna Sui capsule collection for Tarjay before everyone else (on September 13). The Bullseye special pops up through Saturday at 54 Crosby Street.